Rutland Clocks specialises in the servicing, repair and restoration of all types of antique clock both spring and weight driven. 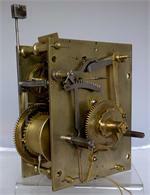 MOVEMENT REPAIRS Servicing includes dismantling the movement and cleaning all brass and steel work within the movement. The movement is fully inspected with particular attention to pivots and pivot holes (bearings) and the pallets of the escapement which drive the pendulum. These are the elements of a clock which first show signs of wear, particularly when the lubrication oil fails or evaporates away. Missing parts can be replaced and broken parts can be repaired to match existing using cast brass, old brass or carbon steel. Wherever possible damaged parts are repaired so as to conserve as much as possible of the original movement. The movement is re-assembled using new gut or lines where applicable and lubricated using the finest quality Swiss clock oil. The clock is set up and tested for two to three weeks so that good timekeeping can be established. DIALS Silvered chapter rings, subsidiary rings and dials can all be re-silvered and the numbers re-waxed in our workshops. They are then finished with either micro-crystalline wax or clear lacquer according to your preference. Brass dials can be lightly cleaned and waxed to leave a more muted finish or they can be fully cleaned, polished and lacquered to bring them back to their original appearance. Enamel dials are cleaned and minor imperfections can be minimised. 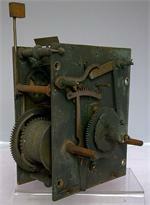 Should serious restoration be required we would arrange for this to be done by a dial specialist. Painted dials can be lightly cleaned with good results to remove smoke discolouration etc. If necessary they can be fully re-painted by a specialist and we can arrange this for you. CASE CLEANING AND REPAIRS We would lightly clean any case that comes into the workshop and deal with any minor repairs. Serious case repairs and restoration can be sent to a local renowned specialist. PRICES The following list is a guide to the cost of servicing - a free estimate will be provided before any work is begun. We collect and deliver clock repairs within a 30 mile radius of Oakham in Rutland free of charge and a mileage charge beyond this distance by arrangement.